Garson, G. D. (2013). Factor Analysis. Asheboro, NC: Statistical Associates Publishers.
" To reduce a large number of variables to a smaller number of factors for modeling purposes, where the large number of variables precludes modeling all the measures individually. As such, factor analysis is integrated in structural equation modeling (SEM), helping confirm the latent variables modeled by SEM. 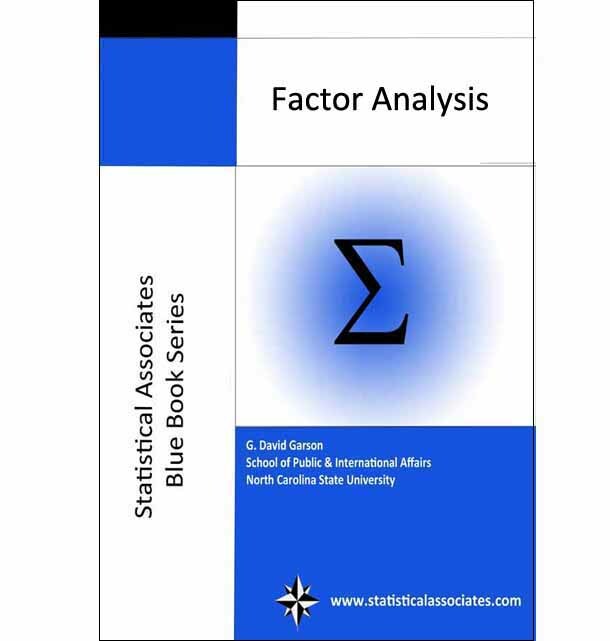 However, factor analysis can be and is often used on a stand-alone basis for similar purposes.
" To establish that multiple tests measure the same factor, thereby giving justification for administering fewer tests. Factor analysis originated a century ago with Charles Spearman's attempts to show that a wide variety of mental tests could be explained by a single underlying intelligence factor (a notion now rejected, by the way).
" To validate a scale or index by demonstrating that its constituent items load on the same factor, and to drop proposed scale items which cross-load on more than one factor. " To select a subset of variables from a larger set, based on which original variables have the highest correlations with the principal component factors.
" To identify clusters of cases and/or outliers. A non-technical analogy: A mother sees various bumps and shapes under a blanket at the bottom of a bed. When one shape moves toward the top of the bed, all the other bumps and shapes move toward the top also, so the mother concludes that what is under the blanket is a single thing - her child. Similarly, factor analysis takes as input a number of measures and tests, analogous to the bumps and shapes. Those that move together are considered a single thing, which it labels a factor. That is, in factor analysis the researcher is assuming that there is a "child" out there in the form of an underlying factor, and he or she takes simultaneous movement (correlation) as evidence of its existence. If correlation is spurious for some reason, this inference will be mistaken, of course, so it is important when conducting factor analysis that possible variables which might introduce spuriousness, such as anteceding causes, be taken into account. New in the 2013 edition: Greatly restructured for better readability. Major new section on categorical (nonlinear) factor analysis in SPSS CATPCA, SAS PROC PRINQUAL, and Stata POLYCHORICPCA. Coverage for Stata as well as SPSS and SAS, including importing data into Stata. Coverage of factor space (factor loading) plots. Hyperlinking of FAQs to key words in the text. Expanded discussion of rotation methods.